A blog dedicated to Retro and Vintage furniture, revamped and refurbished with love. A little while ago you might have noticed that I asked the question on my Facebook page (Retro Vintage Love- please 'Like' my page if you like my work!) whether I should paint this little chest a coral colour or grey. It was almost 50-50, but grey just won out. Luckily for my fellow colour lovers, the coral is coming, I promise! Here's what the chest of drawers looked like before. As you can see it was pretty poorly. The handles don't look too bad in pictures, but they were actually horrible plastic things, and one was missing, so they had to go, and the exterior was pretty chipped up and rough. I sanded the whole thing back completely, which was a pretty horrible job due to the age of the varnish, then gave the whole thing a couple of coats of undercoat. For the colour, I went with a Dulux colour called Moxa which is in the same range as the Ashville that I used to paint these chairs, however it is a bit darker, because I mixed the colour myself with some white enamel paint to make the finish more durable. I bought new handles from Riverclay in Eltham. They have a lovely selection of handles and knobs. For the record, Bunnings do not. These were brass, I lightly sprayed them with black paint, there is still a little of the old brass visible, which I love. My new coffee table. Love!! I am beyond in love with my new coffee table. It's an old pine number that in its previous life was stained stained stained! I spent HOURS sanding out the thickest, deepest, darkest stain and as I did, this gorgeous timber grain appeared. Here is a (terrible) pic of the table before its makeover. The coffee table before. I cannot describe how thick this stain was. ﻿﻿﻿﻿﻿﻿﻿﻿﻿﻿﻿﻿﻿﻿﻿﻿﻿﻿﻿﻿﻿﻿﻿﻿﻿﻿﻿﻿﻿﻿This piece of furniture is for our own home, which I love doing because I can paint with COLOUR! When I'm doing pieces for sale I try to be a little mindful of the fact that not everyone loves colour as much as I do, but I really think that once you've got some coloured pieces in your life you'll never want to go back again. Try it and see! I had initially planned the pale blue legs with an oil top, similar to my shabby chic white hall table, but I was just loving the bare timber. Then my brother in law (BIL) mentioned that he had seen some cool white wash furniture whilst he was out and about (he's a very talented sparky) and the seed was planted. If you're following me on Pinterest you'll have noticed that I pinned quite a few white wash pieces on my Furniture Inspiration page. 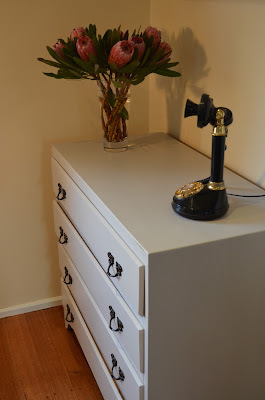 If you're not following me on Pinterest what a great opportunity to check out my boards, lol- search for Retro Vintage Love Furniture and you'll find me! ﻿﻿﻿﻿﻿﻿﻿﻿﻿﻿﻿﻿﻿﻿﻿﻿﻿﻿﻿﻿﻿﻿﻿﻿﻿﻿﻿﻿﻿﻿﻿﻿﻿﻿﻿﻿﻿﻿﻿﻿﻿﻿﻿﻿﻿﻿﻿﻿﻿﻿﻿﻿﻿﻿﻿﻿﻿﻿﻿﻿﻿﻿﻿﻿﻿﻿﻿﻿﻿﻿﻿﻿﻿﻿ I painted the base in a pale blue / aqua of my own making and distressed them- I think the distressed look goes perfectly with the whitewash top, even though my husband just doesn't 'get' distressed. He thinks I've missed spots even though I actually spend quite a bit of time planning where I will distress and exactly how much to distress! I loved trying out the whitewash technique. The effect is very subtle. I used about 1:4 paint to water ratio and was working quickly to brush on/rub off within about 30 seconds for each section. If you're new to painting this would be a great technique to try. I honestly don't think you could stuff it up, it's fast and fun. If you would like to give it a try and have any questions, please just email me or leave a comment! I finished my top with a spray of British Paints Poly top coat. I'm going to give it a week and see if I want to give it another coat too, depending on how much wear I use. ﻿﻿﻿﻿﻿﻿﻿﻿﻿﻿﻿﻿﻿﻿﻿﻿﻿﻿﻿﻿And finally, the finishing touch, I found the CUTEST little knob in a little shop near Eltham train station (this is also where I got the knobs for the little chest on my cover picture). How much do you love this stag?! If you haven't noticed, deer are the new birds. They are suddenly popping up in all the decorating magazines. As are cow skulls, which I am yet to be sold on. I love how the colours on this knob match perfectly with the top of the table. What coloured furniture do you have (or want) in your home? Til next time, happy painting! Don't forget to pin this to your Pinterest page! 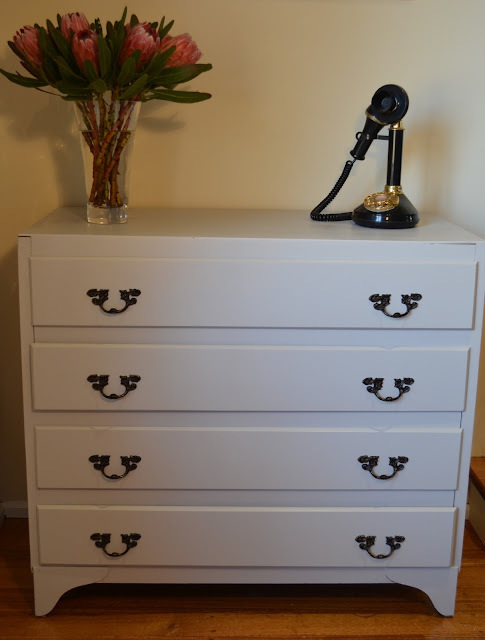 Queen Anne Vintage Bedside Tables Painted White White White! French country provincial style white and timber coffee table- cute as a button!